This brief article describes a useful technique for fiction writers using Scrivener, letting you label scenes according to which character’s point of view they’re written from. I don’t personally find those options very useful. Thankfully, they’re editable – both the values and the colours. I like to use them to help me track the shifting point of view (PoV) across chapters. Typically, a novel will periodically shift between the PoVs of different characters: the protagonist and antagonist, for example, and possibly a few others. Finding the right rhythm of PoV-changes is important, because otherwise the reader can feel that a particular character hasn’t been seen in a while, or is incidental to the story - or even forgotten entirely. Balancing (or biasing) the flow of points of view is a useful way to build or decrease tension too. 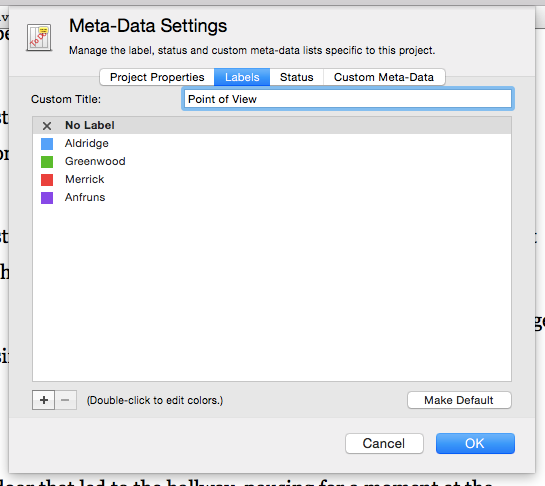 If you click the Edit… option in the Label popup in the Inspector, or choose Meta-Data Settings… from the Project menu, you’ll see a sheet where you can modify the meta-data for the current project. Select the Labels tab in that sheet. You can change the actual title of the Label popup to something else; I use “Point of View”. Then, create appropriate entries for each significant character’s PoV in your story. The popup in the Inspector that used to be called Label will now be called Point of View. There’s more. You can choose to show the PoV colour elsewhere in the interface, to give you a visual overview of how the PoV is shifting in a given chapter or section. In the View menu, open the Use Point of View Color In submenu to select the options you want. I like to enable both Icons and Index Cards. 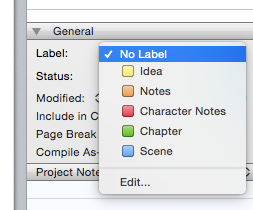 Now, the Binder will show your scenes or chapters colour-coded by Point of View. 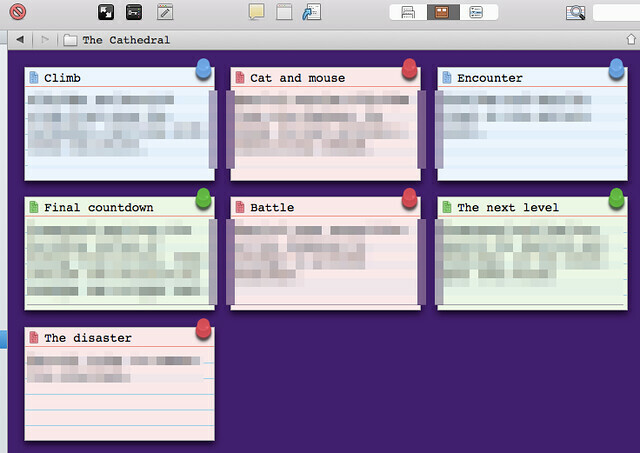 When you switch to the Corkboard view, you’ll also see your scene or chapter index-cards shown with the appropriate PoV colours. I also find it very helpful to add a per-scene synopsis. The PoV colour will even show in the Synopsis section of the Inspector, in any view mode. Get into the habit of setting the PoV value whenever you create a new scene. You can also quickly see which scenes don’t have a PoV set, because they’ll be white in the Binder or Corkboard. It’s a trivial tweak, but I find it provides real value when trying to get a sense of how long we’ve spent on each thread of the story, and where opposing-view scenes perhaps need to be interspersed. Switch PoV every couple of chapters in the initial 25% of the story, to introduce characters and create interest. Spend slightly longer in each PoV during the next 50%, with occasional quick switches back and forth during conflict. In the build to the climax, switch rapidly to build tension, eventually unifying the PoV as protagonist and antagonist presumably meet. There are many other ways to tell a story, of course, but the important thing is to take conscious control of pace, and the progress of the various threads of narrative. 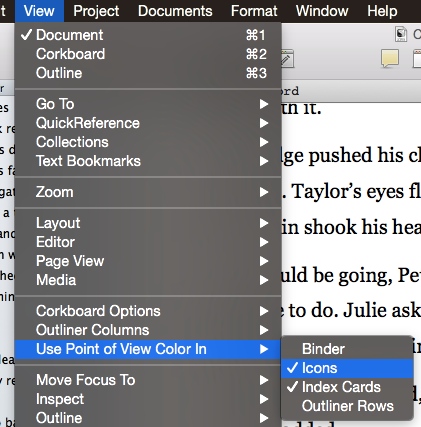 Setting Scrivener to track PoV for you visually can really help, with very little setup cost. 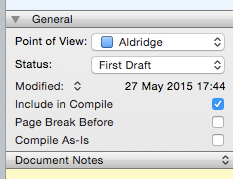 I’ll be sharing more Scrivener tips in future. You can find an archive of them, or subscribe to a topic-specific RSS feed, by clicking here.